We discussed the process of designing and implementing the Balanced Scorecard in the eTraining, “Practical Introduction to the Balanced Scorecard”. In this bonus mini-lesson, we will focus on the implementation plan for the Balanced Scorecard. It will require a significant investment to design a Balanced Scorecard for your company and put it into use. As a result, it is obviously necessary to create an implementation plan. What should this plan include? First, you should know who will be involved in designing your Balanced Scorecard. Your top managers are not enough! To successfully implement the Balanced Scorecard, you must involve all key members of your team. Second, you need to decide what software tools you will use to support the Balanced Scorecard. If your company is very small, MS Excel might be enough. In a larger company, you will definitely want to consider using some automation tools. Our BSC Designer software, available at www.BSCdesigner.com, includes a freeware edition, as well as a 30-day free trial of our professional edition. Once you have decided what tools to use and who will be involved in the process of designing your Balanced Scorecard, you can add more details to your implementation plan. 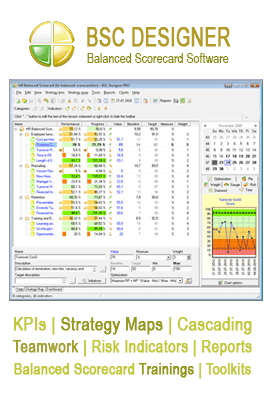 You need to decide who will design your indicators and strategy maps, and who will combine your scorecards into a cascade. You need to plan to update and revise your Balanced Scorecard. After one or two months, you will need to evaluate the scorecard, and find out how well it works in your company. And you need to decide how to implement the Balanced Scorecard in your company. Which business units will use the scorecard? What business problems do they have, and how can you use the Balanced Scorecard to solve those problems? 1) Business problems and strategic goals: your Strategy Maps. 2) Measurement and improvement: your Key Performance Indicators. 3) Line-level actions: the Initiatives that link actions and indicators together. To learn more about the Balanced Scorecard, please visit www.ScoreCardTrainings.com.